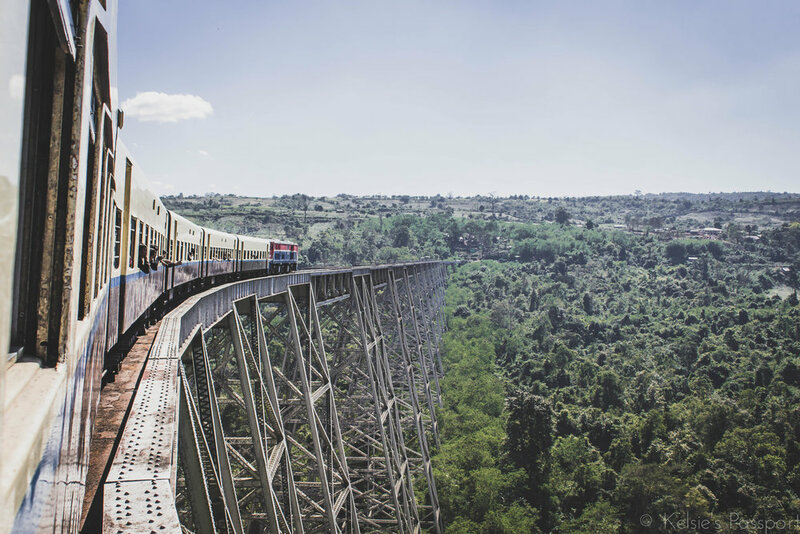 The quality of these photos mimic this particular train ride perfectly; a lil bumpy, a lil blurry, but a beautiful view with lots to see. 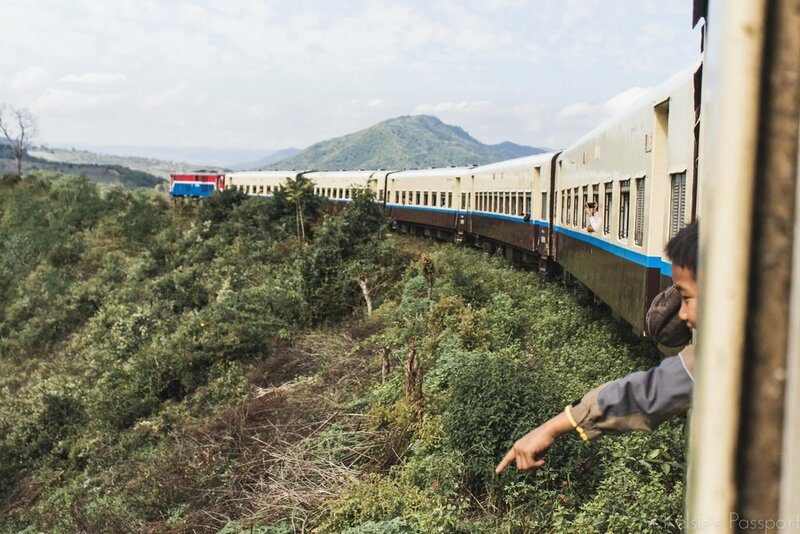 The Myanmar countryside is ridiculously picturesque, even from the hard, wooden seat of a train; a train that, in my maybe-a-little-paranoid-opinion, is trying to kill you. The carriages rock back and forth so violently that from the outside I imagine it looks a little like a drunk person staggering home, 10 bars deep. More than once I had the feeling it was going to toss me overboard out the window, which had no glass, so no option of shutting it for safety. More likely than the train trying to get rid of all it’s riders is the fact that the size of the train tracks don’t match that of the train, which I once read somewhere (but now can’t remember where, so don’t quote me). I boarded at the Pyin Oo Lwin station. It was small, with only one platform. As the train picked up speed we passed farms, towns, rivers, mountains and field after field. There was corn, sugar cane, rice, rice and more rice. Men and woman wearing bamboo hats with bags slung over their shoulders bent down to pick the rice. Oxen pulled wooden plows over churned up land. 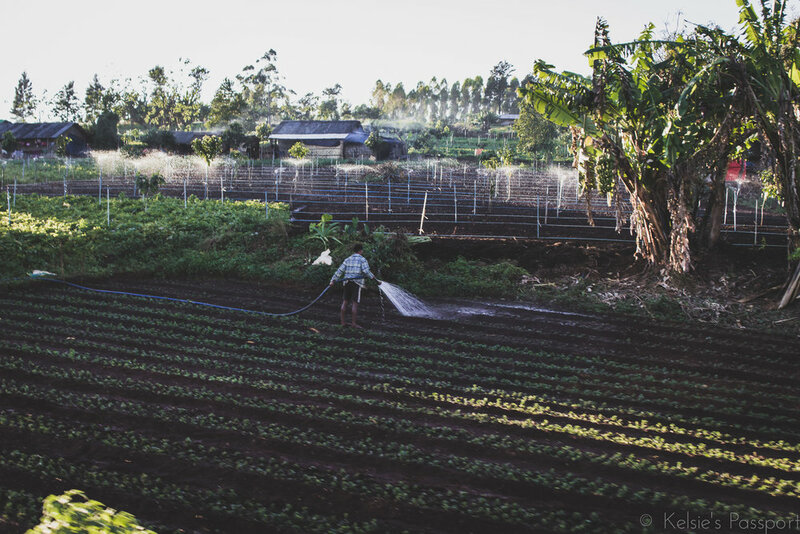 Sprinklers threw mist over the dry areas. There was green vegetation everywhere. Mountainside pastures held sheep, goats and cows. We flew past small towns with no more than 10 houses, and bigger ones with busy streets. 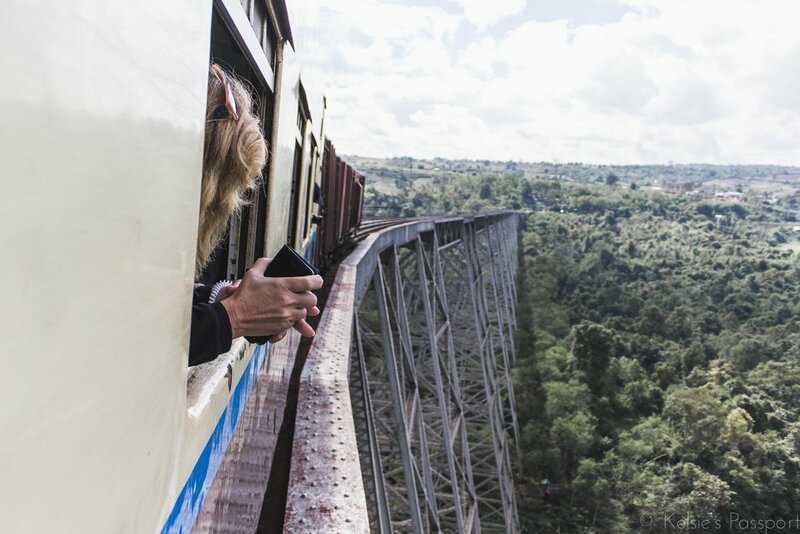 Some of the journey is passed through very dense bush that’s cleared just enough for the train to fit through. More than once I was smacked in the face by a passing banana leaf because I was leaning with my head too close to the window. Don’t stick your arms and legs out the window on this train guys (probably don’t do it on any train, actually). Each rail station we stopped at was bustling with activity. People shouted out the items they were toting. Women carried all sorts of food on their heads, vegetables, packets of endless snacks, rice and meat dishes, cobs of corn, noodles (literal noodle heads), etc. The kernels on the corn were the biggest I’d ever seen. One guy I sat near was feeding the kernels to some mice who were on board with us and I got a flashback memory of the scene from the Cinderella cartoon (anyone know what I’m talking about? When Gus tries too many kernels of corn and he can’t handle it and almost gets eaten by the cat? No?). The highlight of the trip was the Gokteik Viaduct crossing. I first heard about the viaduct when I read The Great Railway Bazaar by Paul Theroux. It made me want to see it. It’s funny how reading a description in a book can do that to you. I hadn’t even seen a photo, but I wanted to go. It was the second reason I wanted to go to Myanmar, besides Bagan. When I caught my first glimpse, I wasn’t disappointed. It’s exactly as it’s described. A huge viaduct across a lush valley. Luckily, the train slows down considerably while crossing, and the lurching back and forth was much less. Falling out the window over the valley would have been game over. After a few days in Hsipaw I did the same journey back again, but continued through Pyin Oo Lwin, all the way to Mandalay. On the way into Mandalay I experienced one of the best sunsets I’ve ever seen. The whole sky was lit up in pink, orange and red. Descending down the mountain into the city is a bit of a harrowing experience. The train has it’s own version of switchbacks, where it goes forward a ways, and then stops and heads backwards and downwards, and then stops and starts forwards and downwards again, etc. It repeats this route until it’s at the bottom of the mountain and can safely go straight forward. Because of this the journey takes a long time to go the short distance from Pyin Oo Lwin to Mandalay, even though on the map it looks like a short ways. The ride from Pyin Oo Lwin to Hsipaw takes about 6 hours. Although Mandalay is not much further than Pyin Oo Lwin, it takes about 11 hours from Hsipaw to Mandalay. 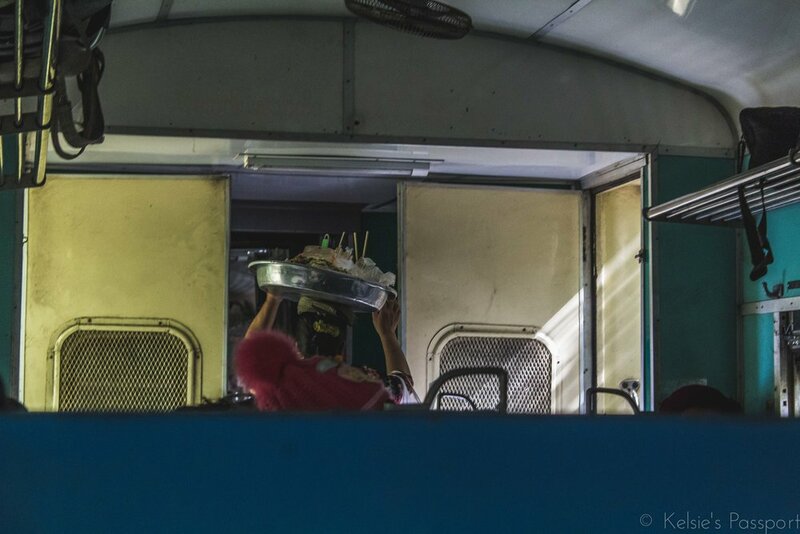 This particular train runs from Mandalay all the way to Lashio, though most people only go as far as Hsipaw. Second class tickets will get you a seat on a hard wooden bench in a otherwise clean carriage. First class will get you softer, individual seats. Both classes will provide you with an opportunity to meet locals and sightsee out the open windows. First class costs about double that second class costs, but both are extremely cheap. 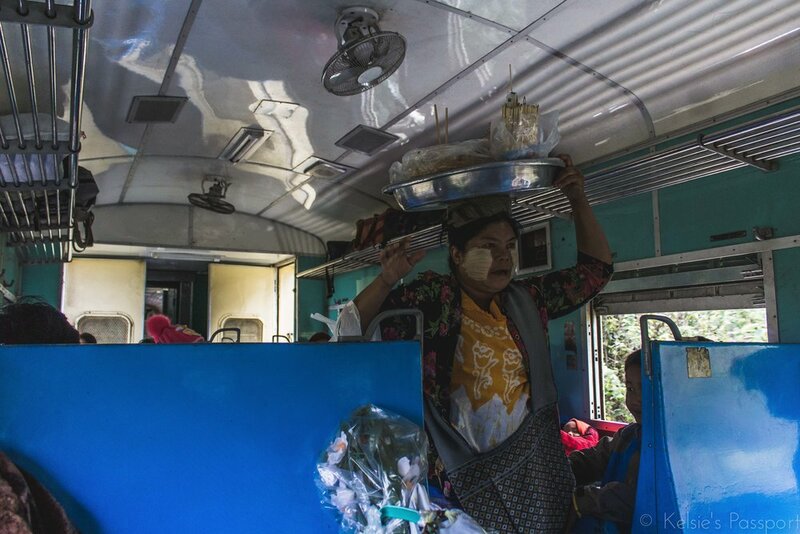 The ride from Pyin Oo Lwin to Hsipaw costs 1,200 kyat (0.90 USD) Ordinary Class and 2,750 kyat (2.05 USD) Upper Class. Hsipaw to Mandalay costs 1,700 (1.30 USD) OC and 3,950 (2.95 USD) UC. So it’s not going to break the bank, even if you’re as ridiculously cheap as me.